There are many different types of systems and mechanics that rely on hydraulics each and every day. The best way to avoid costly and potentially dangerous accidents, it is always best to have a preventive maintenance program in place for hydraulic hose services. Whether you take care of this maintenance yourself or you hire a team of professionals to do it for you, you can count on LaCava Brothers auto parts in Fall River, MA for top quality car parts and accessories, including hydraulic hoses and fluids. Preventive maintenance works to protect your high-value machinery to keep it running efficiently and effectively. If you can spot potential issues before something breaks, you could save yourself a lot of time and money in repairs. When a job is at stake, time is money. The amount of time it can take to perform hydraulic hose services and repairs during an emergency could cause you to lose a job or, at the very least, get behind on a deadline. In the event of an emergency situation, you can trust our team of highly trained and experienced technicians at LaCava Brothers Auto Supply & Services to come out to your place of business and perform professional hydraulic hose services. We keep all of the necessary parts and fluids in stock at our Fall River, MA location so we will be ready to assist our long-term clients and any new customers who might be in need of our services. Our emergency hydraulic hose services are available seven days a week. Our custom hoses provide the ultimate fluid conveyance system and are available in a wide range of pressure ranges and abrasion resistance. 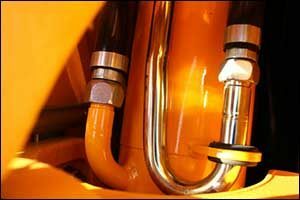 All of the hoses that we use at LaCava Brothers car parts and accessories are built with long-lasting, high-performance applications in mind. No matter how hydraulic hoses configure into your work day, you can rest assured knowing that the services you receive from LaCava Brothers is top notch. Regardless of the type of work you do, we highly recommend preventive maintenance services. Our team of technicians can perform these services for you or we can supply you with all the auto parts in Fall River, MA that you might need to get the job done right. We only use Gates hydraulic hoses and parts, which has been a leader in hydraulic hoses since 1911. We gave elected to use MegaCrimp couplings, which have been proven to offer 500% better corrosion resistance than other brands. There are many advantages associated with preventive maintenance for hydraulic hose services. Relief from safety concerns that can be a real risk to injury for employees reduced downtime from emergency repairs, increased life and durability of the machinery and more efficient operations are just some of the benefits that our clients receive from regular hydraulic hose services. In the long run, preventive maintenance services help businesses to get more out of equipment, requiring fewer repairs, emergency services, and replacement costs. The reason why safety concerns are so high on the list for hydraulic hoses is that they operate under extreme temperature and pressurized conditions. The temperatures of hydraulic hoses can reach upwards of 300 degrees Fahrenheit, despite normal operations being between 150-180 degrees. The pressure inside of these hoses is nothing to scoff at either, reaching as high as 10,000 PSI in some situations. All of this pressure and high temperature means that a break in the line can be catastrophic, causing damage to technicians and quite possibly to the machine itself. If you are located in the Southeastern Massachusetts area and are interested in learning more about our hydraulic hose services and other professional services, contact our Fall River office by calling 508-676-1951. In addition to providing top quality auto parts in Fall River, MA to consumers and professionals, the services that we offer are top notch. Call today or stop by our location on Bedford Street to view our inventory of car parts and accessories. 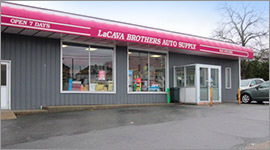 For over 70 years, the locals have trusted LaCava Brothers for all of their car parts, hydraulic hose services and professional customer service.